Microsoft has introduced a new Perceptive Pixel 84″ 4K communal computing device at it’s recent Windows 10 media briefing event held in Redmond. Microsoft Senior Director, Security Business, OSG Group Hayete Gallot announcing the Microsoft Surface Hub said the device is to create a new Windows 10 experience that would re-imagine meetings and help groups of people be more productive together. A team device, a simple intuitive Windows interface designed for groups, with ink and touch at its core. 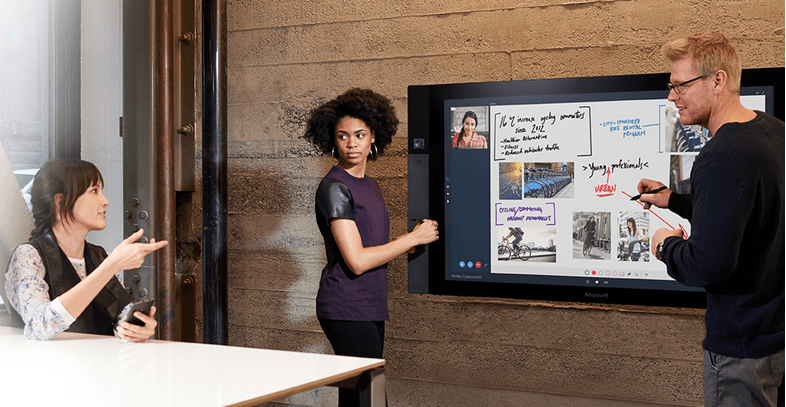 The Microsoft Surface Hub hardware specifications include; 84-inch or 55″ (comes in two sizes) 4k display; large-format pen and multi-touch experience. Display and touch sensor are phase locked at 120Hz so the display refreshes every 8.33 milliseconds. The device is powered by a Fourth Generation Intel i5 and i7 processor. Full 1080p cameras on each side with wide field of view, built-in mic with the Xbox Kinect technology to detect and follow voices in the room while eliminating background noise, speakers, wi-fi. It also offers a variety of inputs including wireless projection, HDMI, NFC, Bluetooth and ports to connect to peripheral devices. Pricing and availability has not been made known yet but should be in the possible near future. This is an enterprise hardware and will definitely be on the high.